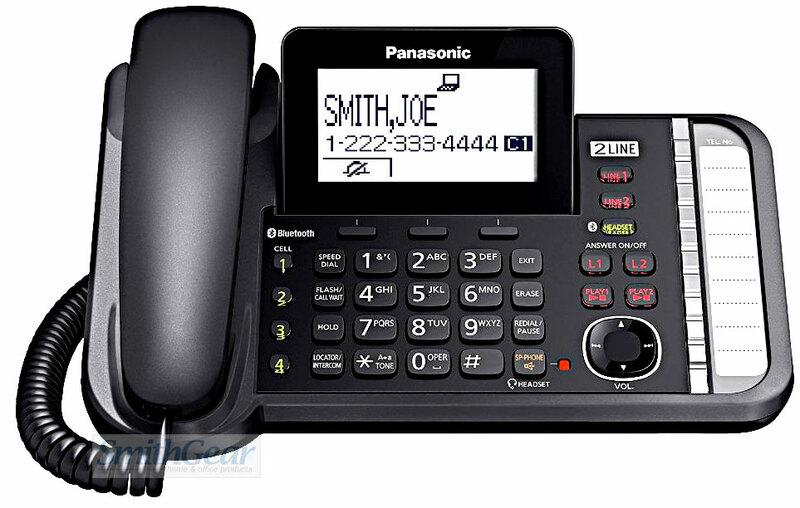 The Panasonic KX-TG95811B is a two-line telephone that utilizes Link2Cell® technology, allowing for up to three calls to be placed simultaneously. With its convenient new features including the dual answering machine system and power back-up operation, the KX-TG95811B is ideal for home office and small business use. Block unwanted calls by entering caller ID information into the phone's memory -- system blocks up to 250 numbers. The KX-TG95811B automatically disconnects any callers on the block list and emits no sound to the caller. The phone has a two-answering-machine system that can be used separately on each land line for private and professional use. Each land line can be registered with a certain time zone and separate outgoing message for incoming calls. Power backup operation allows users to stay connected during a power outage by providing an extra battery in the base unit for up to three hours of usage time. And -- with the optional Range Extender accessory, conversations can be extended up to double your existing range. This bundle (KX-TG95811B) includes a total of (11) extra handsets of KX-TGA950B. Copyright © 2007-2019 SmithGear. All Rights Reserved.